UPDATED: Wed., March 21, 2018, 9:23 p.m.
ANN ARBOR, Mich. – When Jordan Poole’s long 3-pointer dropped through the net for Michigan, a whole lot of unsightly shooting beforehand was forgotten. It’s been that kind of season for the Wolverines, who are winning without much concern for aesthetics. It was just 14 months ago that Illinois center Maverick Morgan said, somewhat accurately, that Michigan had been a “white-collar team traditionally” – but you won’t find many people saying that about the Wolverines this season. Michigan struggles at times from beyond the arc, and the free-throw line has been a nightmare. Yet here the Wolverines are, preparing to play in the Sweet 16 for the fourth time in six years. Watching Michigan win with defense is a bit disorienting. It’s like if Tom Osborne or one of those option coaches showed up one year with an offense that averaged 500 yards passing. For a decade under John Beilein, the Wolverines could put on an offensive clinic, with smart passing, sharp outside shooting and hardly any turnovers. Michigan still tries to operate the same way, but the shooting has been hit-or-miss this season. That was certainly true in the team’s first two NCAA Tournament games, when the third-seeded Wolverines fell behind 10-0 against Montana and took over 5 1/2 minutes to make a field goal against Houston. Michigan still won comfortably against Montana, 61-47. Against the Cougars, it was 64-63 on the buzzer beater by Poole. The Wolverines finished that game 8 for 30 from 3-point range. In the past, Beilein’s best teams at Michigan were led by dynamic offensive players like point guards Trey Burke and Derrick Walton. This year’s point guard, Zavier Simpson, has an awkward-looking outside shot and an even stranger routine at the foul line. But Simpson has been perhaps Michigan’s most important player, a defensive pest who did a good enough job on Houston’s Rob Gray that the Wolverines were able to advance. Houston and Montana both shot under 40 percent from the field. 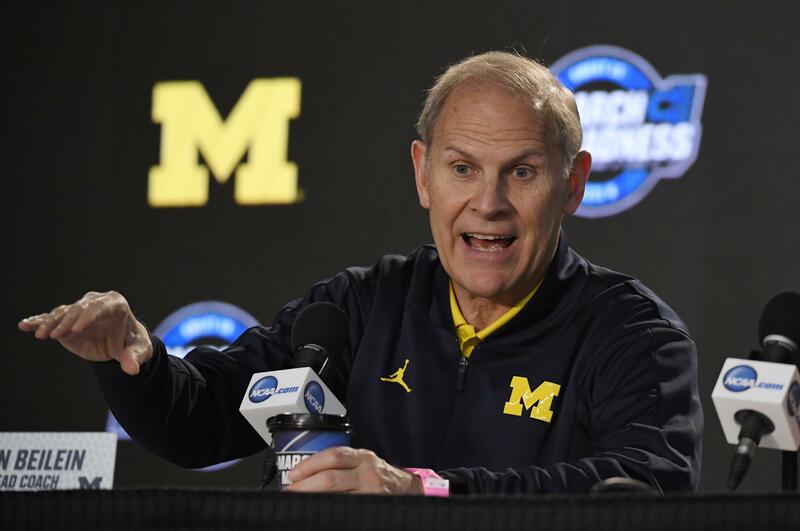 Michigan’s matchup Thursday with seventh-seeded Texas A&M could be another battle of attrition. The Aggies have held opponents to 40 percent from the field on the season. After making it past Houston, Michigan is suddenly the highest-seeded team remaining in its entire half of the bracket. If the Wolverines can return to the level they reached in winning the Big Ten Tournament, they’ll be tough to beat. Michigan’s offense was more impressive in that tournament, and if big man Moe Wagner can stay out of foul trouble, that would do a lot to help the Wolverines out of their offensive funk. But even if Michigan struggles to score, the Wolverines have an impressive backup plan, given how effectively they are stopping their opponents. In fact, smothering teams with great defense is probably Michigan’s Plan A at this point. Published: March 21, 2018, 6:35 p.m. Updated: March 21, 2018, 9:23 p.m.